There is some serious beauties there ! Here's my Streamer, I just finished the refin on it. the nut has been replaced by the JANIII, new saddles & knobs. I like its verstaility. Nachobassman, Hardy, imabuddha and 2 others like this. Nachobassman, Hardy, imabuddha and 4 others like this. You got that SSII from japan? Grain looks familiar. Those SSIIs are my favorite, 2012-2015 years. So naturally I started looking at all of Warwick's bass lineup over the years to figure out which I'd like to upgrade to someday. 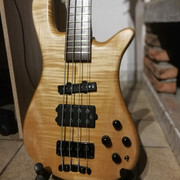 My discretionary spending budget isn't that big (programmer's salary in Japan is surprisingly low), so I figured that my best bet would be a used German bass, probably 90s - early 2000s. Pretty quickly I choose the Streamer body style because my only complaint with the Corvette is that it's neck-heavy even with a wide suede strap. Also the 3d curves on the Streamer looked very comfortable. Of course I drooled over the newer masterbuilt & custom shop basses, but the price is outside my current budget even with a decent discount. Fortunately there are many Warwicks available second hand in Japan, but because I live in Miyazaki on the island of Kyushu (southern most of the 4 main islands) the local selection is very thin. I'd have to mail order or visit Tokyo to get what I want. I often visit several local "recycle-shops" that have some guitars but had only ever seen two Warwicks: a Korean Corvette & an older German Fortress. On Christmas Eve I was surprised to see a 2016 Masterbuilt Streamer Stage 1 in near-mint condition, with all of the latest specs. The price was ¥162,000 or ~$1450 including sales tax! After carefully examining it & playing it for a few minutes I knew my dream was going to become a reality. After trading in my Corvette I got it for $1250. It has all of the original paperwork & accessories, and there's almost no fret wear. I don't know why the original owner let go of it so cheaply; maybe he/she died & their spouse just dumped it? So this is my Christmas miracle. I'm so happy! verb, jester, caveman666 and 6 others like this. Congrats on the gorgeous bass, and the great deal! Rehan and imabuddha like this. No, I actually acquired it in the US in January. Yes, SSII is my favorite as well. Mine is a 2015. Iv shown my stage 1 before but man it's such a beautiful bass, every time I play it I smile. Here it is with its new upright buddy. Rehan, StreamerII84, Hoggles and 3 others like this. Nice! I had a 7 string tight spaced version just like yours that I sold and miss. Yeah I like the broad spacing, 20MM on the Warwick and 30MM on the NS design. When I jump on my other basses with standard spacing feels really tight. I have been pondering a 7 string. Did yours have a Low F# or a higher string? Congrats on the amazing acquisition, enjoy the bass! I tuned it like a 7 string guitar BEADGBE. I played guitar for 10 years before switching 10 years ago and all my chord knowledge had that tuning. The low F# just doesnt sound right, to flubby. One more and I'm done for awhile. This 2016 Streamer Stage I was delivered to me on Monday. Nachobassman, PaulS, Hardy and 4 others like this. Thanks guys! I feel super lucky to have found this bass at a price that I was barely able to afford and to be the owner of it. Let’s just say it helped that it’s currently tax return season. @Hoggles I know you’re also into naming your basses and I have named her Sky. Funny that with this purchase I had to promise my wife no more basses for 1 year... . This one was definitely worth making that promise. Hardy, Hoggles, PaulS and 2 others like this. This result of a tax return happened already some time ago. I threw some new strings on it and hope for some inspiration! Maybe a power ballad for the next album. Nachobassman, Toepfer, Rehan and 2 others like this. Holy hell Hardy!! Beautiful. How long does it take to string that up? Rehan, imabuddha, Hardy and 1 other person like this. Just twice as long as it takes for a 5 string. It takes a short time to get used to the octave strings, but actually it happens quite easily. PaulS and Hoggles like this.